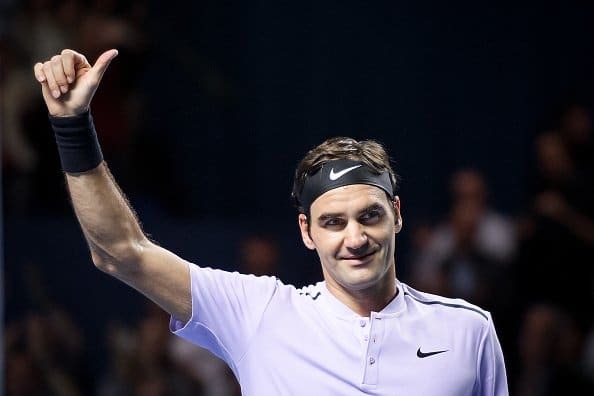 Roger Federer might be sponsored by Rolex but he was the Speedmaster Professional in Saturday's Semi-Final as he produced tennis from another planet to crush David Goffin 6-1, 6-2 in just 1 hour and book his spot in a 13th Basel final. 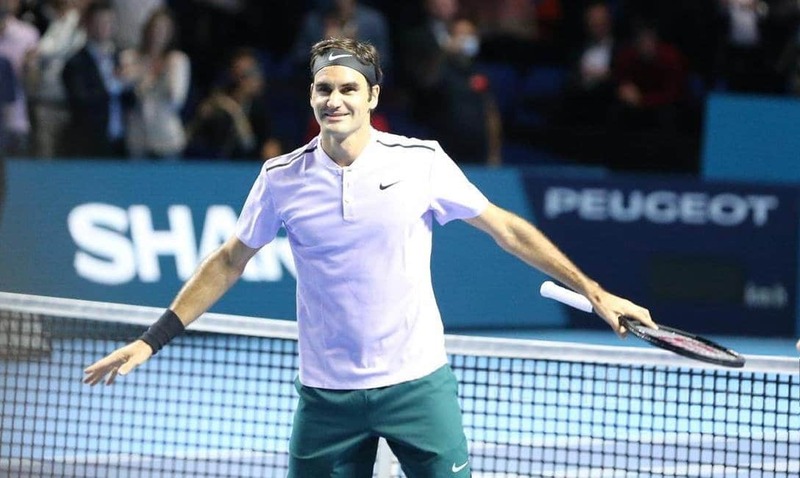 It was a clinical display of Swiss precision and hyper-aggressive hitting as he fired 20 winners and won 91% (21 of 23) of points behind his first serve which devoid the Belgian of any rhythm and enabled Roger to improve to 11-1 vs. Top 10 opposition this season and give himself a shot at title number seven of 2017 in tomorrow's final. Goffin won the toss and elected to receive. Roger held to 15 to kick things off and immediately went about attacking Goffin's serve creating 0-30 and a breakpoint at 30-40. The Belgian came through to hold for 1-1. A love hold put the pressure immediately back on the Shenzhen & Tokyo champion and he faltered dropping serve after saving two break points as Roger moved into a 3-1 lead. Another quick hold put the Swiss up 4-1 and in game six he reeled off some huge forehands to break again before serving out the set 6-1. With Goffin unable to weather the storm he dropped serve in the opening game of the second set and Roger consolidated to love for a 2-0 lead. The Belgian got on the board in game three but it took a mammoth effort and a 15-minute game to finally hold. Roger's serve, however, looked impenetrable and after firing down two holds for 4-2 he came up with another stunning return game to lead 5-2. The Swiss then served it out to 30 to move into his 13th Basel Final. An absolute masterclass this one from start to finish as Roger completely manhandled Goffin who had no answers. Some of Fed's groundstrokes were phenomenal and once he got the lead his game was in full flow. The forehand was like a gun going off when it hit the strings and all Goffin could do was scramble from the back of the court to no avail. Another one-man highlight reel really and a Fed tribute video makers dream as there are plenty points in there to add into the compilations. As for Goffin, on a quickish surface he just doesn't match up well with Roger; a weak-ish serve and not a heavy enough hitter to prevent himself getting overpowered. In terms of speed, his groundstrokes are actually amongst some of the quickest on tour, but he's not hitting with a lot of spin nor is he hitting a heavy ball like Del Potro. As a result, it just comes onto Roger's racquet nicely and he's able to take big cuts at the ball to devastating effect. Next up is Del Potro who came through an absolute turd of an encounter with Cilic to make the final. Both guys played poorly but it was Del Potro's serve that made the difference in the end as Cilic made too many cheap errors. Roger won their last encounter in Shanghai to avenge the US Open loss and obviously dominates the H2H but Del Potro has two Basel titles to his name where he defeated Roger both times so it should be an interesting encounter. I don't think Del Potro's played great this week dropping a set to Sousa and struggling against Agut but he's found a way to win and has the extra motivation tomorrow; he's playing for London and beating Fed in his hometown so it should be an interesting match. I give Fed the edge. Completely blew Goffin off the court, Master vs. Apprentice, Men vs. Boys. Whatever you want to call it, it was a complete carve up out there. Yeah just too good. Bet Goffin tearing down his posters. Mozart with tennis shoes playing with a Stradivarius in his hand :-). I am short of superlatives ! What a masterclass reminding me the one against Berdych at AO 2017. Today we are grateful to Speedy Roger for the recital and Speedy Jonathan for the comments. One more step tomorrow … and a 95th title ? Peak performance, peak reporting. The bar raised yet again. Absurd firecrackers off the FH, and so fast I cld barely breathe, let alone poor Goffin! Let hope he can bring the heat to Delpo who always seems to raise his damn game v Rog. I want an annihilation please, for those 2 final losses……. At least he has played him a lot recently so no mystery at all. Thanks. yeah just so quick today, moving so good. Hope Del Potro takes a beating. Did you see his reaction when Agut hit the ball at him? Bit OTT. Yes! Finals! Come on Roger! You’ve got their column stats reversed, no? Was wondering about this, too, Emily. Tomorrow is Roger’s 13th Basel Final, surely the “13” will be a lucky number for Roger. Fingers and toes crossed. Thank You, Jonathan, for all the speedy reports you gave us on all the matches. You deserve a Star! Yeah the columns were named wrong earlier but right now. Jonathan, you got the names mixed up in the match stats section! By the way, amazing match! Cheers, fixed the columns ? Thanks, yeah sorted the stats ? Surely Federer played as well as he has ever played. I didn’t even have time to get stressed. Please, Fed, please play as well as this against weedy Del. This had everything, great serves, fabulous ground strokes and some really cool volleys. I tried to give him five stars above but the computer registered 4.7. Can I have a Hawk-Eye challenge? Super fast turn-around for you too, Jonathan. Haha yeah it’s not the best for clicking 5. Are you on laptop or mobile? For laptop gotta like click and hold right at the very end. Mobile I think is even harder. Love Goderer mode. Breathtaking shots and moving so well. If Delpo wins tomorrow, I will definitely need counselling. Nauseating thought. Yes, you and me both, the entire stadium and the TennisTV commentators. Hopefully, as a wise man said, he hasn’t peaked too soon. And hopefully he won’t hesitate to take advantage of jmdp’s apparent difficulty in moving by, ah, making him move. He seemed to be dialled in on going behind Goffin today. Potentially off-topic, & speaking of Goffin – English-language commentators sometimes have a hard time pronouncing his name, & say there really isn’t an equivalent English sound. I think you can get very close by saying “Goff-FANG”, but omitting the “ng” sound. Just never close your throat at the end. In case you were wondering 😉 . You read the last part as the “un” in “unbelievable”, just without pronouncing the “n”. That will be “Go-fu(n), better luck next time”. I thought I’d heard it pronounced “Go-f[whatever]”, i.e. with a long “o” rather than a short one? To rhyme more or less with “Dauphin”. Juan Martin Del Trolltro is injured every time he plays lately. Must help his mindset or something. Delpo better watch out. Fed is in a murderous mood. Only Delpo’s serve can delay matters, unlike Goffin’s poor and weak serving. Fed’s groundstrokes were mind-boggling. Needs to keep the same level of precision and accuracy tomorrow. Fed in straights. Been pretty lucky with predictions this year. Indeed, Del Potro’s serve has got him through some matches this week. Hopefully Fed is feeling the returns. Thanks Jonathan. Poor Goffin; Roger just clubbed him into submission 🙂 . For tomorrow, Roger still needs to improve his 1st serve % and moves Del Potra around. He will be holding the trophy for the 8th time 🙂 . Yes, the first serve % wasn’t brilliant. And a shortage of aces compared with yesterday (although admittedly far fewer games played). Jonathan, two write-ups in one day! You’re a star! And thanks 🙂 would have been three if I could have mustered a Paris preview but guess there is a chance Fed won’t play. The so called smart match was just playing the percentages and letting Cilic destroy himself.Which of course he was happy to do.He will have to be ‘smarter’than that against Fed! Not smart for the crowd, it was an awful match! Precisely. Nadal was the major catalyst of Fed’s improvement and current other alien form. Love this take and I tHink Fed has always played to this ideal and it is what sets him apart, resonating universally and making him so beloved as opposed to the the other three in particular who actually do just want to club and nullify and win at any cost. Well observed Rui! that hopefully carries over for a thrilling encounter with Delpo. Fed and Team 8 wins whatever the outcome. The writing and turnaround also breathtaking thanks Jonathan! I think your comparison is more related to what is said in the build up to fights ratherr than what happens in them. Once these guys step in the ring, it becomes very much about presenting your opponent with technical difficulties just like Tennnis. Floyd Mayweather never tore apart or eviscerated anyone, he schooled them with the best boxing skills ever seen. So there are many similarities in the sports. What was that match??? How is Federer producing this lind of tennis? Even as a die hard, someone who always wants federer to win. This is unfathomable level of tennis from the maestro. If he plays like this for the next two seasons (assuming he abides his contract with basel), he ll take his legacy to a whole new level. Getting back to the basel finals – Yes Juan Martin has had the better of hkm here in ’12 and ’13, but this is a completely new federer to me now, he has proved it time and again the entire season literally. Unless Federer is completely off his radar, I dont see him losing. Heavy favourite to me. I guess Jonathan might do a reminiscing 2017 post or something like that to ponder on what our man has done this year. The statistics say 48-4 (92%) win loss record – which is ridiculous. I am sensing he ll skip paris to save his energy for clinching another big title at the WTF. Does he have 19 slams? Well those numbers will change, mark my words! Yeah, too good really at 36 to be pulling this stuff off. Clearly the greatest skillset of all time. Masterclass today! A flash report! Thanks Jonathan. It’s going to be an epic one tomorrow and Roger will raise the trophy yet again. Better performance, Roger was in hurry to finish off Goffin. Stone cold kill shots. I hope he remains on this form against Delpo. Despite the 18-6 h2h Delpo still has the ability to take the match out of Rogers hands. Both men will be gunning for each others backhands and preventing each other from teeing off on the FH. I don’t think that will be Fed’s tactic, he overplayed to the backhand at USO i thought? Agut did the same in that first set, changed in second set and started dominating. Awesome. Just awesome. It was staggering performance from Fed. Is he still David’s idol after that? Hope he keeps his killer instinct for the final. No mercy Roger, allez! Haha I bet Goffin tore down his posters in a rage ? 🙂 when they shook hands at the net after the match, Goffin’s look on his face was saying, gee, you could have spared a few more games and after all I have your poster in my bedroom 🙂 🙂 . Other than the three matches at the US Open, this is the worst Roger has played all year. Serving for the set at 5-4 and broken like a bum? Up 3-0 in the TB and then proceeding to lose the next SIX points? The end of that set was a gruesome amateur hour display. I’ve never been more furious watching him hack and blunder away a totally winning set, and he’s had no shortage of those, especially lately. And DelPo wasn’t even playing that great! If he loses this match, he should apologize to the city of Basel for such a low quality outing. How about that game at 2-1? Roger has a volley that high school JV players will make 9 times out of 10 to go up 3-1, and misses it 5 feet out. He is an embarrassing clown today, I’m sorry to say. Horrifying. This is how a true moron plays. Missing a 30-30 putaway forehand ten feet out, serving in the first game after grabbing the initiative in winning the second? Missing a volley three feet in front of the net at break point? He deserves to lose today, but he should be ashamed of himself still. This barely qualifies as tennis. What a disappointing choke job. For heavens sake, calm down. Hyperbole abounds here. Federer is hardly the first professional tennis player to choke to this degree, and it’s hardly the first time he’s done it either. It’s disappointing how little he’s played in on big points today but I’ve seen many worse performances from him and from everyone else as well. He won. Should keep an eye on that instead. Well, I take it back. He seems to pull these out when I get furious at how he plays. =) Quality wasn’t very good, but well done battling, especially in the third. Great! RF has done it again! Basel is RF again! What a battle! The Mannarino match was only skirmish comparing to this one . Ge, what happened to Roger’s serve??? No matter now 🙂 🙂 :), congratulations for the first 8th trophy on HC !!! Come on, give Fed a break. Remember when I told that he is the goat because of his human fallibility and the ability to accept the errors and find a way round? This is RF, ladies and gentlemen. So out of this world and so human. Game should make for an insane highlight reel – I am half hoping delpo doesn’t end up in the wtf because he looks a real threat to a 100% record.